TEMPLE AND VILLANOVA KICK OFF 2018 NEXT SATURDAY AT THE LINC! 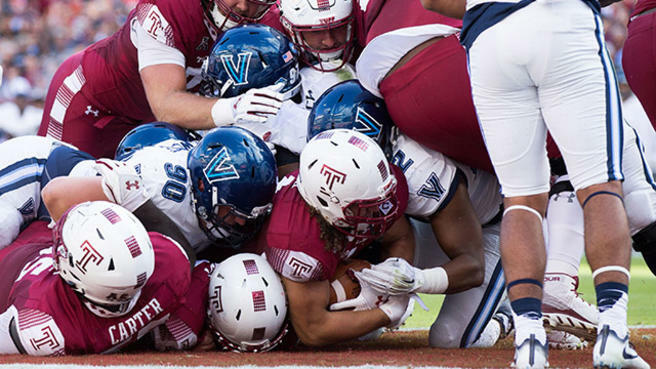 College football season kicks off in Philly next Saturday, Sept. 1, when the Villanova Wildcats meet the Temple Owls at the Linc at noon. The game is on ESPN News, and Vegas has installed the Owls as a 15 1/2-pt. fave. Villanova is coming off a five-win season last year, but it gave Temple a scare and ended the season with a 21-point victory over Delaware. Villanova returns its experienced quarterback in Zach Bednarczyk, who completed 70.2 percent of his passes in five games. Aaron Forbes and Justin Covington both return at running back, a duo that combined for more than 800 rushing yards, while Ryan Bell and Jarrett McClenton provide experienced targets on the outside. Defensively, Villanova lost a few key players from a unit that allowed just 16.1 points, but the Wildcats are led by a group of senior linebackers in Jeff Steeb and Keeling Hunter, who should be able to hold down the fort. Malik Fisher is also a young pass rusher who had three sacks and two forced fumbles last season. The Villanova Wildcats are confident this will be a bounce back year with the returning players they have and much better injury luck on their side. 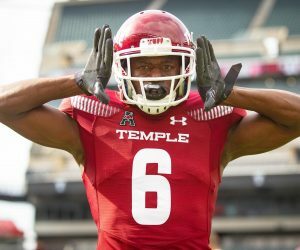 Temple has flown under the radar despite 27 wins the last three seasons, and the Owls hope to build on their first bowl victory since they were in the MAC. Temple returns its starting quarterback in Frank Nutile, and it’s going to be interesting to see what he can do now that he’s no longer splitting reps with anybody. Ryquell Armstead and Jager Gardner have a chance to be one of the better running back duos in all of college football, while Isaiah Wright returns as the Owls leading receiver and a big play threat downfield. Defensively, Temple returns its leading tackler in Shaun Bradley, an NFL caliber defensive lineman in Michael Dogbe and one of the better defensive backs in the AAC in Sean Chandler. Temple will continue to be a feisty defensive group few want to play. The Temple Owls have split their last six season openers. The Wildcats are 4-1 ATS in their last 5 road games. The under is 5-0 in Wildcats last 5 non-conference games and 5-0 in Wildcats last 5 games overall. The under is 9-2 in Owls last 11 games on grass and 4-0 in Owls last 4 games in September. The over is 5-1 in Owls last 6 games overall. Previous EAGLE DOUGIE P NOT JUST PISSED AT FOLES: WHOLE WOEFUL OFFENSE! Next IS SIXERS CO-OWNER DAVID HELLER THE DE FACTO GENERAL MANAGER?